The first press coverage of my debut novel – Charlie Green and The Pirate’s Treasure – appeared in the Shoreham Herald, Thursday, March 31. 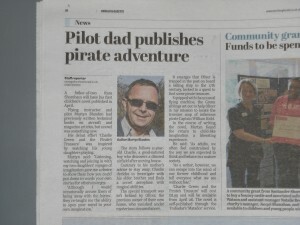 The catchy title given to the feature captures both the book and my experiences – Pilot dad publishes pirate adventure! With years of experience of writing technical aviation manuals (two books published) I was inspired – over six years ago – whilst playing with my two daughters to embark on my first novel. I love working on craft projects with them and at one time we built a two-storey play den at the bottom of the garden – they named it their ‘Fairy Dell’. Within it they acted out their fantasies and I found myself being taken back to my childhood days and thought of the stories I had enjoyed. I was enthralled with the H.G. Wells book The Time Machine and fascinated by the adventures of buccaneers on the high seas in old sailing ships. Someone once said, “Life is what happens to you while you busy doing other things”! Finding time to do what you would really like to do is not always straightforward, and being in the right frame of mind to write a novel came to me on holiday. As that only happens once or twice a year, my first book took a few years to complete! With a different approach, Charlie’s next adventure is already occupying plenty of pages and the first draft is nearing completion after only six months! If I had a pound for every time I’ve thought, I wish I could have been there, when reading about historical adventures. Stories like The Secret Garden also inspired the theme of time travel on a journey through history and my passion of flying meant there was only one machine appropriate for the transportation of my adventurers! Reports of the lost treasure of Capt. William Kidd – amongst others – excites many people with the thought of discovering a hidden horde that might still be somewhere for the taking and it got me thinking about – what if? What if you could actually travel in time – what would you do, where would you go? I remember that as a child I dreamt of going to many places and being on board a sailing ship discovering new lands was one of them, or a swashbuckling pirate ship chasing a Spanish treasure ship! I relive and share my childhood dreams through the antics of Charlie Green and his siblings in Charlie Green and The Pirate’s Treasure, published on 28th April 2016.